The documents in this section list typical scopes of program management services for several alternative project delivery methods. The recommended services for the traditional Design-Bid-Build method would be similar to those services recommended for CM-at-Risk. Though various alternatives to this traditional method have come into greater use in recent years, and for some of those alternative methods for as long as 30 to 40 years or more (in the case of Design-Build) the traditional method is still preferable to many owners. Also, many owner organizations, particularly in the public sector, continue to be oriented primarily to this method. CM-at-Risk can be used for either new construction or expansions/remodelings, from simple to complex building types. It can also be useful in projects for other types of Owners as long as procedures for retention of leverage are provided for in the Owner-CM contract and an appropriate plan of management is followed. CM-at-Risk can also be combined with the Bridging method. The Design-Build method of construction project delivery can be a very successful way to manage design and construction for the project owner for a fairly wide range of building types. It is best used by an owner organization that is in a position to rely upon relationships in the procurement of construction. 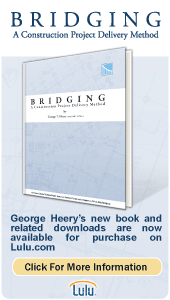 The Bridging method of construction project delivery is a hybrid of the traditional Design-Bid-Build and the Design-Build methods. It retains the better features of each of those project delivery methods and eliminates aspects of both that can sometimes cause problems for the Owner. The “Construction Management Agency” project delivery method was the basic “CM” idea that emerged in the 1960s as major construction programs, particularly public agency programs, began to be undertaken after World War II. During that period this early alternative delivery method was simply referred to as “Construction Management” or “CM”.